Adult male monarch butterfly photo © Jennifer E. Dacey / University of Rhode Island: www.insectimages.org. 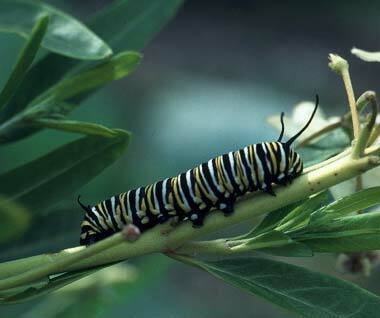 Both the monarch caterpillar and adult butterfly are brilliant in color as a warning to predators (the monarch ingests toxins from the milkweed plant which are poisonous). 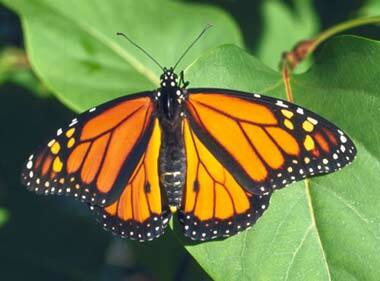 Monarch butterflies were once a common sight in the summer months; soaring and gliding across the USA. 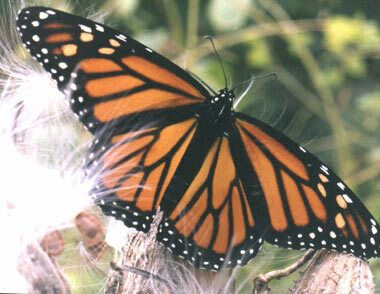 Monarchs make an incredible 2,500-mile migration each year to their nesting grounds in Mexico and southern California. September 12 was proclaimed "Monarch Butterfly Day" during West Virginia's 2004 legislative session to "commemorate and preserve the butterfly of the state, which was declared in March 1995 by Senate Concurrent Resolution 11." Requesting that September 12th of every year be declared as West Virginia Monarch Butterfly Day. That September 12th of every year beginning with 2004 be set aside for the Monarch Butterfly to be acknowledged, pondered, studied, explored, conserved and celebrated.